There are a lot of odds and ends and bits and bobs that go on a fishing line. Here are just few. Swivels serve a couple purposes. They allow you to join line together, they prevent line twists and they acts a stopper for the lead on a fish finder rig or inline lead system. Swivels can also be used as slides. Some helicopter rigs and choddy rigs involve using a large eyed swivel as a slide. Swivels can alert wary fish, so get a swivel that blends in or use a swivel protector and use the smallest swivel you can without compromising your rigs strength. Swivel protectors are a rubber cup-shaped beads that you put on your line above a swivel to cover the swivel. This protects the swivel and the knots attached to the swivel from abrasion but more importantly it helps camouflage your swivel. When using a fish finder rig the rubber acts as bumper for the lead to hit instead of just smacking the swivel and that eliminates the need for a bead. These rubber protectors really improve a rig. 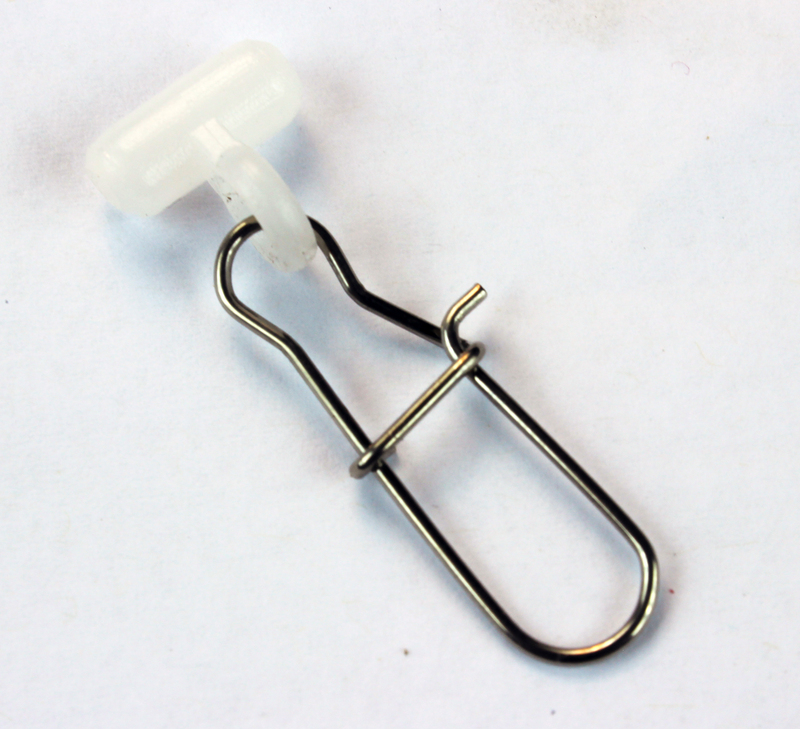 This $.25 addition to your rig will reduce the number of lost fish and rigs and will hide your rig from the most cautious fish. Slides allow objects to travel up and down your line. Their most common use is on fish finder rigs. The benefit of a slide vs. an inline lead is that you can adjust the weight on a slide but you can’t on most inline leads. Adjusting the weight is a constant issue when river fishing. You have to constantly adjust your weight to match the current. Slides can also be used to attach a leader and hook. 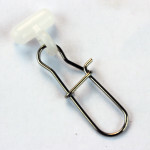 Some more advanced rigs for live bait involve attaching the hook and leader to a slide so that a live fish being used as bait can freely swim back and forth. A quick clip for quickly attaching and removing rigs. Clips are basically fancy safety pins for fisherman. They allow us to change out a part of our rig without having to cut and retie a knot. I like to attach my lead to my line with a clip so I can adjust the weight easily. When using pre-tied rigs I like to attach them to my mainline with a clip so I can change them out quickly. Swivel protectors and rubber sleeves can camouflage your clip just like a swivel and prevent them from accidentally opening in the water. 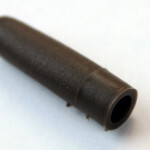 Korda Tail rubbers help cover the clips connecting leads to helicopter rigs to prevent them from falling off accidentally. One of the worst things that can happen to a bait fisherman is to cast your line out only to have it tangle mid-air without you knowing it. You sit for an hour or more waiting for a bite that will never come because your hook, bait and lead are a tangled mess. An anti-tangle sleeve prevents this by acting as spring that encourages the rig to lay straight. Anti-tangle sleeves also increase the chances that your hook and bait won’t land right on top of your lead which can spoke wary fish. Anti tangle sleeves are needed the most when using a braided leader. Braided line is very limp and supple. Monofilament and coated braid lines many be stiff enough that you don’t need an anti-tangle sleeve. But when you are fishing with a supple or semi supple leader anti-tangle sleeves are worth their weight in gold but they cost hardly anything. 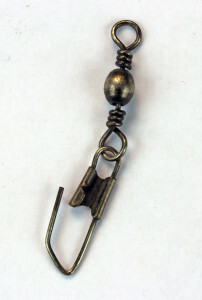 The same fish finder rig with the Korda swivel protector and Korda anti-tangle sleeve pulled back to expose the swivel. Beads have many purposes. 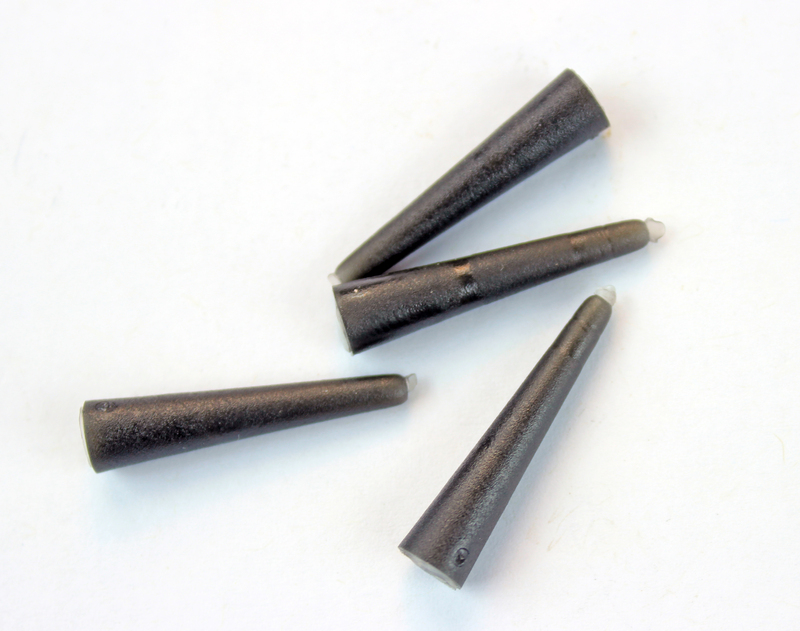 They can act as a bumper to prevent your inline lead from smacking your swivel and sticking. They can prevent a swivel from traveling too far. They can be bobber stops, they are vital to a choddy rig and they can help secure your swing arms on a high-low rig. 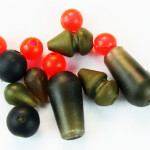 Brightly colored beads are meant to act as an attractor and camo beads hide your rig. 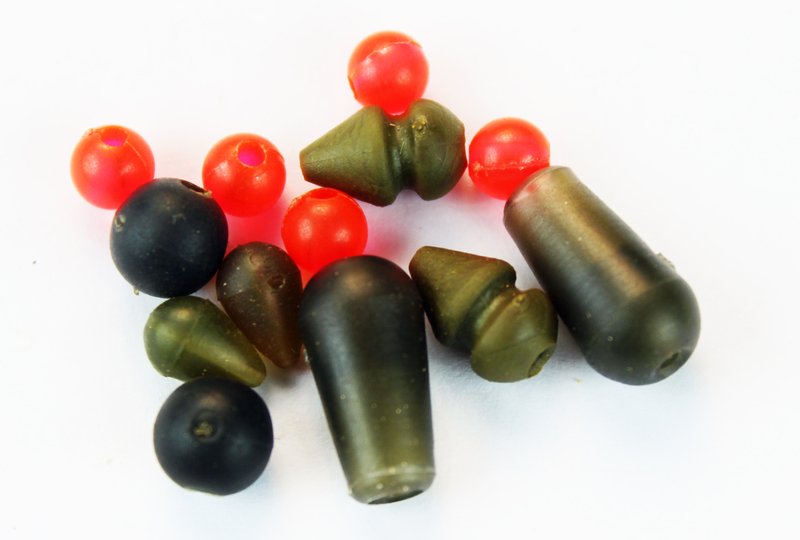 For some reason, many US fisherman use the bright red, orange and green beads they use on their trout and bass lures when fishing for catfish and carp. These brightly colored beads are meant to attract attention to the bead which are meant to be used as part of the actual lure. If you are not using the bead as part of the lure, use a dull earthy colored bead instead. If the bead is not meant to go in the fishing mouth both draw attention to it by making it brightly colored. Shrink tubing is great stuff. 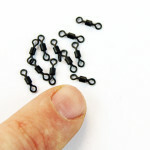 I use it to cover the eye of my hooks when using a hair rig. 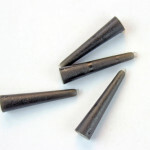 The tubing protects the knot from abrasion and can be bent at a 45 degree angle on certain hooks to encourage the point of the hook to stick into the bottom lip of a fishes mouth. 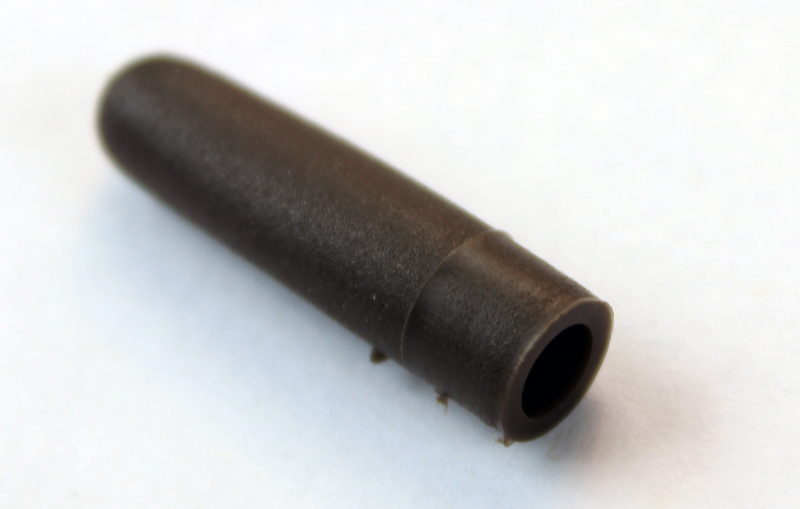 Shrink tubing can also secure a hair to the shank of the hook, be used as a swivel or knot protector or to camouflage excessively shinny tackle. I typically use rings for a couple purposes. 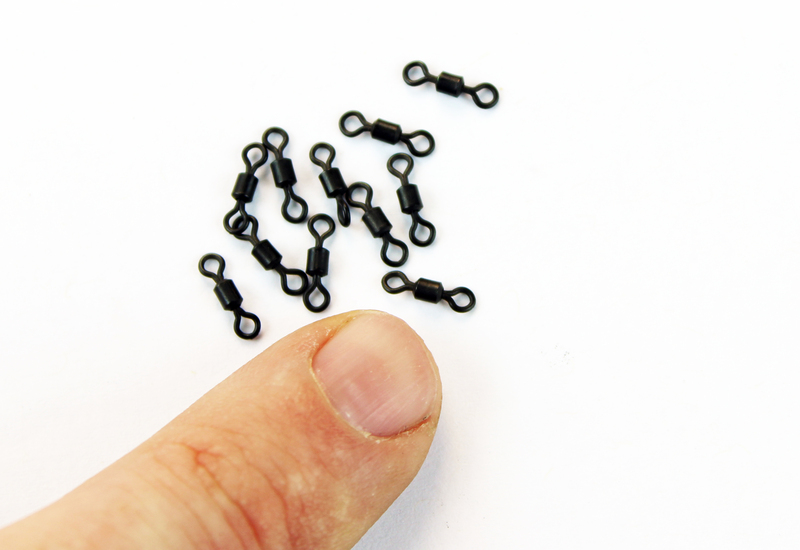 To attach a hair to the shank of the hook, to join mono-filament to braid in a combi rig or to be used as a slide when fishing extremely cautious fish.